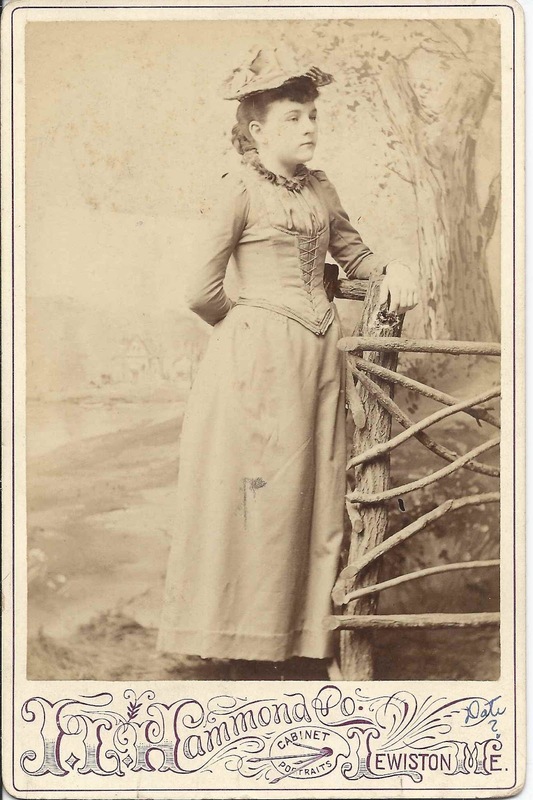 Cabinet photograph of a woman identified on reverse as "Carrie Mitchell, sister of Annie B." 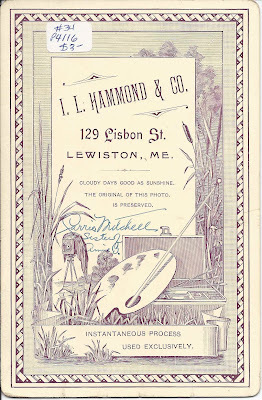 The photograph was taken by the I. L. Hammond & Co. studio at 129 Lisbon Street, Lewiston, Maine. There's a fair chance the woman above is Caroline Emma Mitchell of Auburn, Maine. Carrie had a sister Annie Belle Mitchell. Caroline Emma Mitchell, "Carrie" was born 20 August 1877 at Auburn, Maine, the daughter of Clark and Emma J. (Hunt) Mitchell. 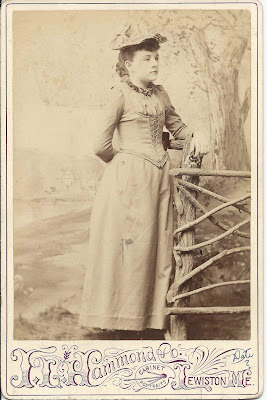 Annie Belle Mitchell, Carrie's sister, was born 10 January 1865 at Auburn, Maine, also the daughter of Clark and Emma J. (Hunt) Mitchell. Their paternal grandparents were Christopher and Esther (Penley) Mitchell. Thier maternal grandparents were Zebina and Dolly (Watson) Hunt. On 23 November 1896 at Auburn, Maine, Carrie married Harry deWilton McBurnie. He was born about 1871 at Windsor, Nova Scotia, son of Joseph H. and Mary A. (Miller) McBurnie. Harry deWilton McBurnie died 13 April 1910 at Augusta, Maine. On 1 February 1916 at Auburn, Maine, Carrie married Frederic Peter Haskell. He was born 7 June 1877 at New Gloucester, Maine, son of Charles Peter Haskell and Helen Marr (Crockett) Haskell. Annie Belle Mitchell married Willis W. Chase on 1 May 1882. He was born about 1860, son of George and Lydia (Corliss or Corlys) Chase. 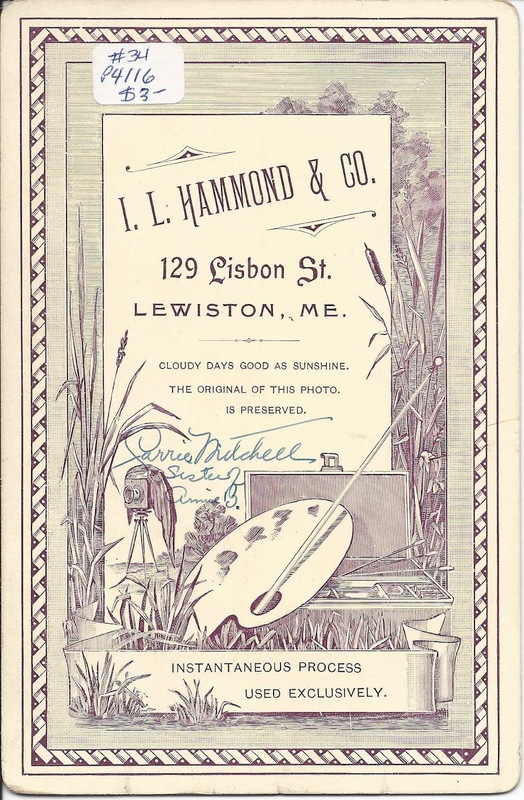 The family was from the Freeport, Yarmouth and New Gloucester, Maine area. If you have corrections or additions to the above information or if you feel that the Carrie Mitchell in the photograph is a different woman entirely, please leave a comment or contact me directly.